In this post, you’ll see why I didn’t become an artist. I feel this subject is too important and too difficult to explain only in text to avoid drawing it out, so please forgive my terrible drawings. 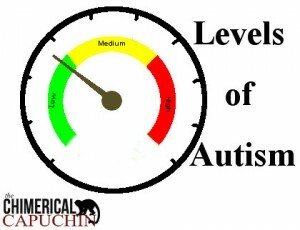 where all autistic people have a set a characteristics unique to them that non-autistic people do not. This is where the all-too-common “He doesn’t look autistic!” comments come from. They expect an autistic person to look and act like Rainman and are surprised when my son and adult family members don’t. 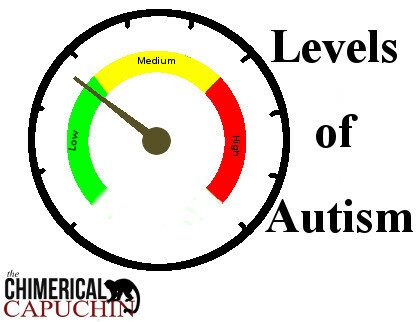 where low levels of autism mean that you are less autistic and high levels mean that you are more autistic. They imagine that the goal of therapy is to move the dial so that the individual has ‘less autism’, even to the point of moving off the spectrum entirely. While this perception of autism is better than the previous one, it still leaves much to be desired in actually explaining or understanding autism. 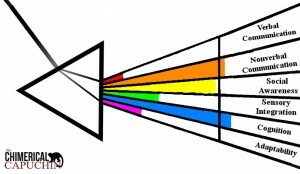 To help people better understand autism, I’ve taken the Prism Theory from this blog and expanded on it to explain why the spectrum is more than just a dial. 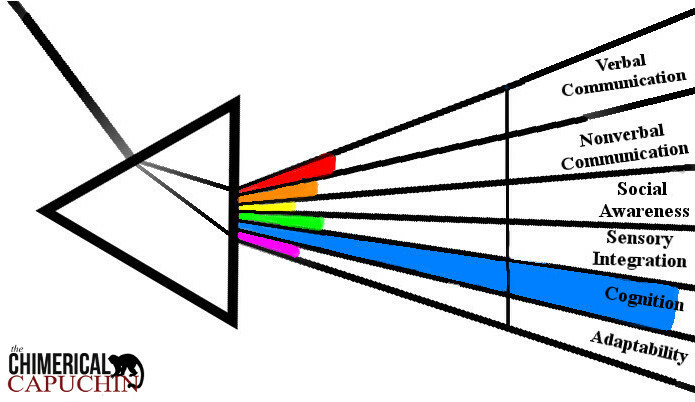 In the Prism Theory, the spectrum is explained as light reflected through a prism. Each prism represents a person and since each person is different, how their prism reflects light will be slightly different from how another person’s prism reflects light. Autistic people can present very differently, because the genes vary even within the same family. The person depicted below is a perfectly adjusted non-autistic person. They are exactly on track and average in Verbal Communication, Nonverbal Communication, Social Awareness, Sensory Integration, Cognition, Adaptability, and the many other categories I’ve left out in order to save space. Some variation, but overall, they are pretty close to average. They may be a bit picky with foods or can’t stand loud, crowded spaces, but not enough to impair functioning or communication. Autistic individuals are typically portrayed in the media as really delayed in every category except cognition, and stories of autistic people by news organizations tend to focus on the ones who are delayed in all categories except for one special talent. While there are autistic individuals who are delayed in all categories, or every category save one, there are many autistic individuals outside of these two limited portrayals. One big reason why only the severely disabled are portrayed in news stories is because they are typically the ones most in desperate need of services. It is extremely beneficial to make the public aware of how badly certain services are needed; however, it leads to a lot of misunderstanding of what autism looks like. This leads to a lot of children being misdiagnosed or not diagnosed at all until adulthood, and a lot of ignorance as to how autism presents. This has lead to fear of autism, violence against autistic individuals, even murder. Another popular way to portray autistic people is as a quirky nerd who has no real need for support systems or as major delays. So What Does Autism Look Like? 1. Persistent deficits in social communication and social interaction across multiple contexts. with the note that these conditions must be present in the early developmental period (even if masked until later), cause a clinically significant impairment, and are not better explained by another disorder. This diagnosis covers a wide range of skills and behavior and is part of the reason autism can present very differently from person to person. It’s also worth noting that autism itself doesn’t cause low IQ and low IQ is a separate diagnosis. Autism is often comorbid with other disorders including intellectual disability, Fragile X, Tuberous sclerosis, etc, which is part of why autism presents so differently. Is this person High or Low Functioning? Well… that depends on who you ask and what scale you use. 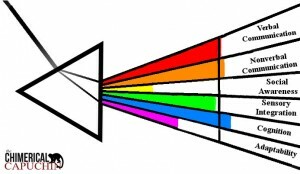 A lot of people within the autistic community dislike using these terms to define people because it doesn’t accurately reflect the variability of the spectrum. Traditionally, ‘Low Functioning’ was measured based on IQ, but measures of IQ of autistic people people have proven notoriously unreliable. Sue Rubin tested at the 2 and 1/2 level at 13, yet went on to graduate college once those close to her found a way to communicate with her. When my son undergoes evaluation, which he does quite regularly for insurance purposes, part of that test is cognition. IQ tests are notoriously unreliable for those under 3, but they are especially unreliable for those under 3 who are autistic because so much of how we test IQ is based on communicative skills and imitation. For example, when my son was very young, one of the skills he failed to replicate was being able to stack blocks. We did Occupational Therapy where we taught him how to stack blocks by doing hand over hand. It took awhile to teach him to do it, but he did and then his scores improved because he had mastered that skill. Almost a year later, he was expected to have the dexterity and understanding to line up like objects, such as putting blocks together in a row make a little wall. Understanding him much better at this point, instead of assuming that he couldn’t do it when he failed to copy us like his neurotypical twin, I thought about what would inspire him to build the line. I told him I was building a car tower and made a little wall with the blocks, then drove a car over it. Since he absolutely loves cars, he was all too happy to copy my actions and make his own car tower. He didn’t lack the intelligence or the ability, but the desire to replication my actions. He saw no point in stacking blocks to make the tower or the wall simply for the sake of building it. This is not to say that all autistic people are secretly intelligent and we only need to discover the key to unlocking their potential. Just as there is a wide range in neurotypical individuals with some who are intellectually disabled, so there is a wide range of autistic individuals with some who are intellectually disabled as well. It is important though, that we always assume competence. This blog post does a great job of explaining how IQ tests can be unreliable for autistic children and why you shouldn’t dismiss even nonverbal autistic people as automatically intellectually impaired. Here’s the prism of an autistic person I know very well. He’s doing beautifully in Communication, has no real problems with Sensory Integration, has above average Cognition based on test scores, but he struggles with Social Awareness and Adaptability. When informed of his diagnosis, most people react with shock or disbelief. They see a well-spoken, friendly man who has lots of friends and seems to get on well with others. It is only when he is out of his comfort zone or stressed that his ‘quirks’ come out. It is only after getting to know him well that you come to realize he struggles with social awareness and recognizing what’s appropriate for a certain situation. His work history is a bit fragmented due to miscommunication and poor people skills in a professional environment. Even very well-educated and informed people tend to think of autism in terms of Rainman, Max from Parenthood, or Temple Grandin. They expect to see a certain set of characteristics and this leads them to be blind about how variable the spectrum can be. They imagine that there is a clear mark between autistic and not autistic, when in actuality, the dividing line between disability and functional within a color can be very fuzzy. Many professionals such as Speech Therapists, Occupational Therapists, etc, unless trained in autism specifically, would miss the diagnosis of the individual I depicted above. For many autistic people, girls and women especially, some colors can shine so brightly, that it can be difficult to recognize when other colors are less vivid. Or, more commonly, people simply aren’t aware of how differently autism can look depending on a person’s prism. When we were planning to enroll in a study on joint attention deficits in children with autism, I had a Speech Therapist tell me that she didn’t think my son would qualify for the study because he made such good eye contact when she engaged with him. She had worked with him for some time and other young children for an even longer period, so she had plenty of opportunities to observe him as well as other autistic and neurotypical children. Luckily, I knew better than to rely on her judgment and we qualified for the study as my son’s joint attention is poor. NOT lack of desire for social communication or social interaction. Autistic people can be extroverts and crave social interaction. My autistic son is actually more social than his non-autistic twin, he just struggles at establishing joint attention and functional communication. It is also worth noting that the strength of these colors can change with proper therapy and time. When my son was diagnosed with autism, his colors were all well to the left of the ‘average’ line based on formal testing. After a year of therapy, some of his colors are above average and all of his colors have improved, although some much more than others. Imagining a dial turning doesn’t do nearly as much justice to understanding my son’s progress as picturing some colors shooting up dramatically, while others still lag behind. It also explains why a person can state, “I was diagnosed with Low Functioning autism” and yet appear to be no different than any other individual. It also explains why I avoid using the term ‘cure’ or saying that we are ‘removing’ my son’s autism. We aren’t. It also explains ‘autistic regressions’, which is when an individual is able to function well at a certain level, but encounters difficulty when expectations increase, causing loss of skills once thought mastered. The requirements for 2 year olds are very different than those we expect of 10 year olds. My son’s obsession with vacuums and fans doesn’t hold back his social opportunities at 2, but he might find it harder to connect with his peers when he’s older. Although my son didn’t qualify for services before he went through his first regression, I noticed signs of autism earlier. At that point, the weaknesses in his colors weren’t identifiable by our current screening standards. I was able to notice them based on my background in behavior observation and because I was screening for autism specifically due to risk factors. A lot of parents point to a specific time period where their child ‘turned’ autistic, but better screening is showing that autism was mostly likely there all along. I was recently involved in an online discussion where a person identified himself as a Low Functioning autistic individual and several people refused to accept this self-identification as they argued that the poster was too eloquent to be Low Functioning. Even after the poster explained that he couldn’t live independently, they argued that this didn’t matter, he was too intelligent. They pictured a dial and thought his dial was turned too high to be in the Low Functioning range. The Prism Theory also explains why some autistic people view their autism as a curse and others consider it a blessing. My son has weaknesses, sure, but he also has some incredible strengths, including an amazing memory. 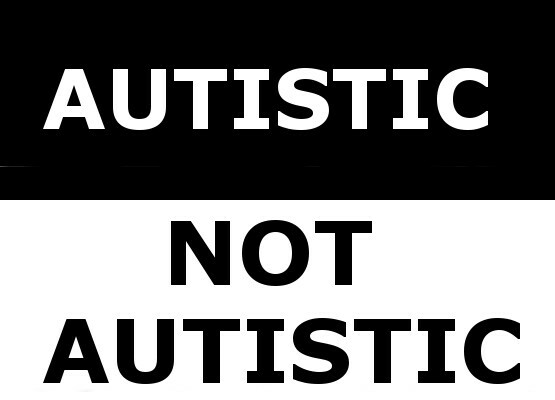 There is great division within the autism community where some of the so-called High Functioning individuals argue with caretakers of some of the so-called Low Functioning individuals over how funds should be allocated, how autism should be viewed, how we should approach autistic children, and other such matters. These divisions need not exist. You can celebrate the vivid colors while still working to help those who struggle with faint colors. You can recognize that just because someone’s colors don’t appear to be bright doesn’t mean that their colors aren’t actually bright. You can recognize the inherent dignity and worth of all individuals, especially those whose colors aren’t or don’t appear to be as bright. The vast majority of autistic individuals, just like the vast majority of people, have both vivid and faint colors, so acceptance of the two together should be natural. So remember, autism isn’t a black and white box, but a rainbow.